墨韵清风 Rhythm of Art is an exhibition organised by the Chinese society. 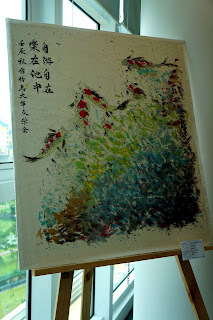 This is a Chinese painting and calligraphy exhibition. 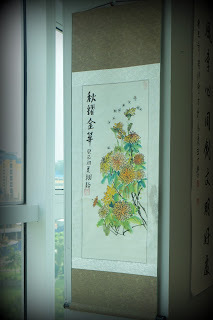 I personally are more into the chinese painting, chinese so called 水墨画.This event was organised in University Malaya and this is the 2nd Exhibition which is not so well known yet. Soon and sooner they might get more attention from outsider or UM students. Venue: University of Malaya Art Gallery (UMAG), Level 5, Chancellery, University Malaya. This is the first time i been to UM art gallery which i always hear one of my friends talking about this place where many art will be exhibited. However, i didn't have time to really stop by there. 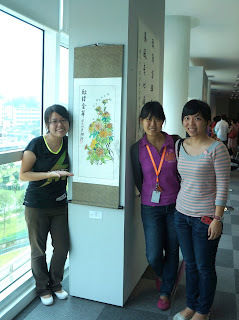 Finally, i take my initiative to come to this exhibition cause i have interest to learn chinese painting. Painting is one of my hobbies a long lost hobby that i never carry out. I used to be very active in drawing and painting when i was young. I join art class when i was primary school and used to paint on the banner for competitions in the Girl guide and Boy scout Gathering @ campfire. Herm...sound like i am getting old and start crapping grandmother story here. Back to this, never know that UM has such an artistic place not only for activity used but also displayed some of the artists production. I am so IMPRESSED!! Why i am here for this event? I am here because of my friend's art work will be displayed there. Who knows when i arrive there, so coincidentally i met my friends over there, one of them is the artwork owner. Taking photo with my friends and her hardwork. Chinese painting is not easy. First you have to master the 4 basic drawing: bamboo, orchid, chrysanthemum and plum flower (梅，蘭，菊&竹). Then only you can proceed to draw small animal like chicks, fish (小鸡, 鱼) and then lanscape，scenery (山水), as you can see below. This picture has the effect letting the people feel the freedom. After a quick look i sit down and take a sip of coffee and out of sudden i saw one pretty shot that i should snap though there is something blocking and makes the whole picture doesn't look nice. Anyway, i still feel this picture really nice among the pictures i took. Beside this exhibition, the other part of the art gallery is displaying other artists artwork like the famous Mr Yusof Gajah. Others artists who i don't really know them. 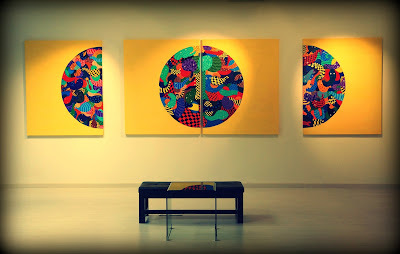 Art in square, in round, in rectangular, in triangle.